Marinated succulent lamb, juicy and beautifully charred. 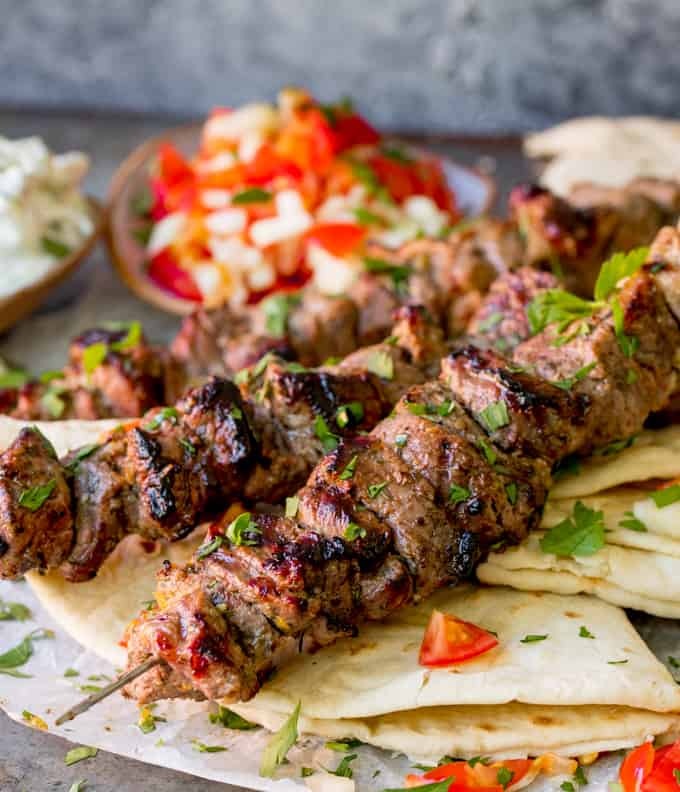 These Greek Lamb Souvlaki Kebabs are so tasty. Cook them on the BBQ for added flavour! Now we’ve got our little BBQ area built, Chris is after having barbecues for every meal. Since he’s the barbecue master, I guess he’s doing all the cooking from now on! and can you believe it…….. I’ve managed to get him in front of the camera for this one!!! I’ve been trying to get him in some recipe videos for AGES, and the only thing that worked was the threat of me touching his barbecue. Heh heh heh. These are my lamb souvlaki kebabs. A recipe I first posted in 2014 when the blog was still a baby in its first year and my photography was embarrassingly bad (I’ll include one of the old photos below the recipe card). Don’t get me wrong, I’m still very good at taking a bad photo, but I’m better than I was. We’ve had lots of barbecues already this Summer, and we intend to take it right through to Autumn and maybe even Winter! Mmmmmm let’s go with grilled meats, hot salads, some slow cooking (leg of lamb cooked over the BBQ for a few hours is definitely the way to go). Anyone care to join me? I’m almost looking forward to Autumn. 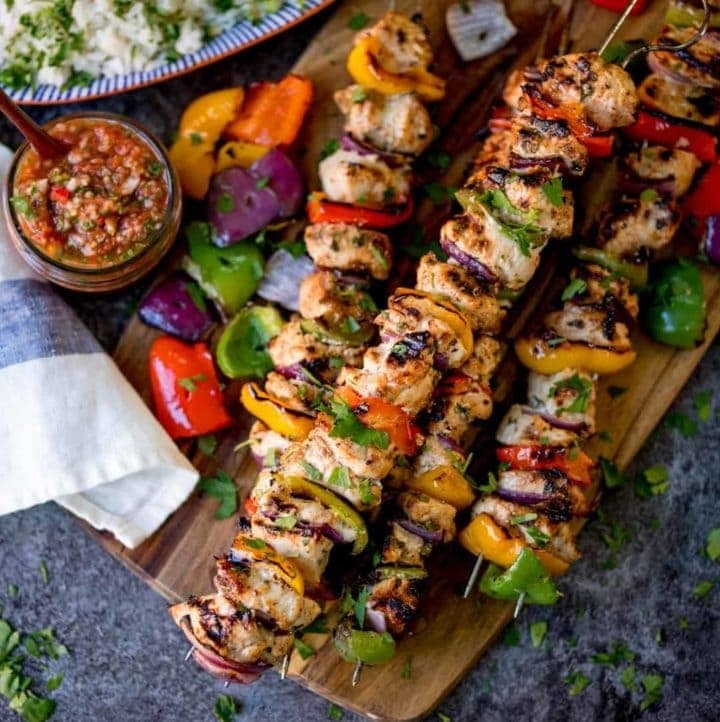 The most amazing time to be outdoors, enjoying the gorgeous colours and the cool breeze with a hot drink in one hand and a steaming skewer of lamb souvlaki in another. Or maybe a slowed cooked brisket and garlic potato sandwich. Yes I like potatoes on my bread. Please don’t judge my carb addiction. Or a nice slab of charred halloumi with a squirt of lemon. The marinade for this lamb imbues some seriously deep flavours – salty, garlicky and with a good dash of lemon, they’re very very moreish. They absolutely taste their best when cooked on the barbecue, but you can also cook them under the grill (broiler) or on a griddle (you don’t even need to skewer them if they’re cooked on the griddle). I love to serve these with homemade tzatziki (I’ll include the recipe below) and also some grilled pittas or my Greek potato hash. Sometimes both!! And then finish off with a delicious quick and easy desert like these Individual No Bake Cheesecakes or a super quick and easy mug cake. They’re quick to make, but you’ve got to let them sit in the marinade for at least 2 hours. There’s no shortcut on this. If you want, you can prepare ahead by marinating the lamb in the morning, and then cooking them for dinner. If you like these, try my pork gyros or my chicken souvlaki too! The lamb kebabs are already gluten free. Just be sure to serve on gluten free pita bread. This recipe call for being marinating ahead of time. You cn marinate in the morning, then cook and eat in the evening. You can cook and then reheat the kebabs (cool, cover and refrigerate, then cook in the oven at 190C/380F, covered with foil for about 15 minutes – or until piping hot throughout). They’re a little tougher when reheated though. Yes. Cool, cover and freeze. Then defrost in the fridge overnight and reheat as per above. 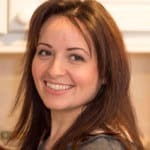 Can we see Chris in some more recipe videos? Yes!! Definitely more to come!! Place the garlic, salt, dill, oregano, cinnamon, pepper, lemon juice and zest in a bowl or ziplock bag. Add the lamb and give it a good mix together. Seal the bag (or cover the bowl) and leave to marinade for at least two hours. After two hours, you’ll see that the lamb has started to go paler in colour. 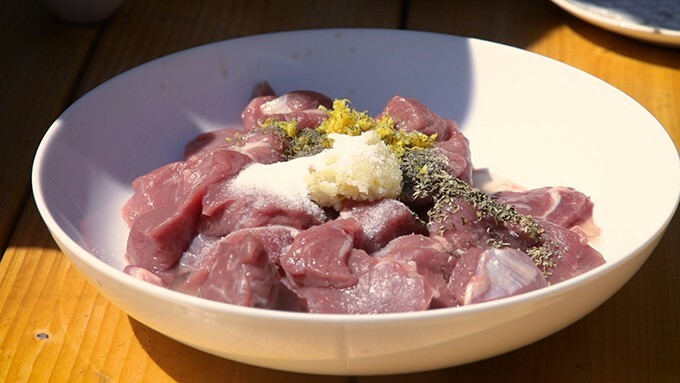 This is caused by the lemon juice which has been tenderizing the lamb. 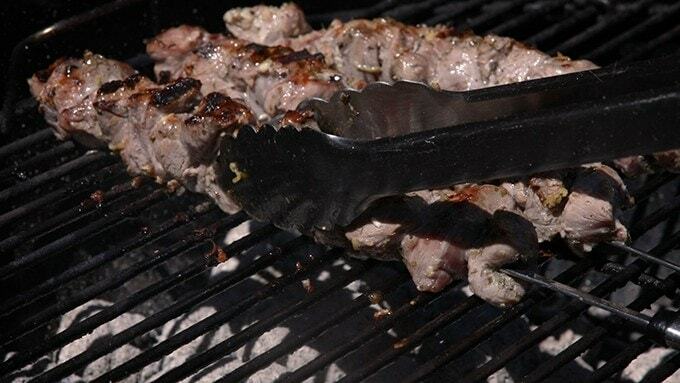 Light the barbecue and wait for the coals to turn white before cooking (this takes around 20-30 minutes). Alternatively preheat the griddle or grill/broiler. Take the lamb out of the bag and place the lamb pieces on 4 skewers. 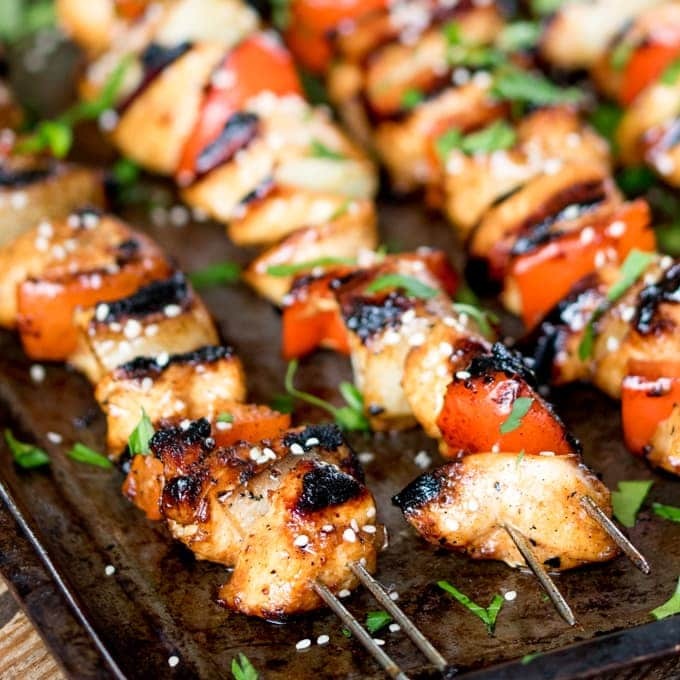 Brush the remaining marinade on top of the skewers and brush with the vegetable oil. 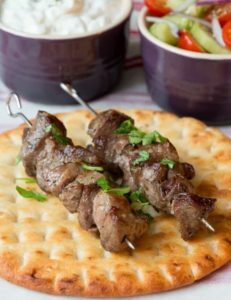 Place the lamb kebabs on the barbecue (or on the griddle/under the grill/broiler) and gril until they’re dark brown and thoroughly cooked. You can test this by cutting into one of the pieces of lamb and checking that it’s not pink in the middle and that any juices run clear. Serve with pitta bread, tzatziki (see recipe in note 1 of the recipe notes) and a tomato/cucumber/red onion salad. Alternatively, these go great with my Greek potato hash. You can cook and then reheat the kebabs (cool, cover and refrigerate, then cook in the oven at 190C/380F, covered with foil for about 15 minutes - or until piping hot throughout). They're a little tougher when reheated though. Nutritional information is per kebab, NOT including Tzatziki or pita bread. This post was first published in September 2014. Updated in July 2018 with new photos, recipe video and extra tips. Here’s one of the old bad photos…. Sorry you are having problems printing the recipes. There is a print recipe button at the top of every page and also within the recipe card its self. Great to see Chris in front of the camera, you make a great team. 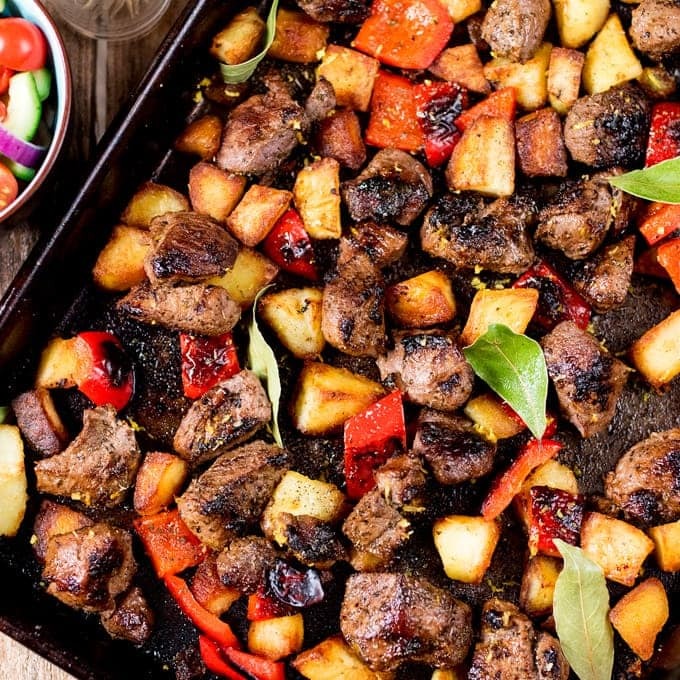 Been making your Greek Potato hash for a while, and will be having it again tomorrow when I make these kebabs. 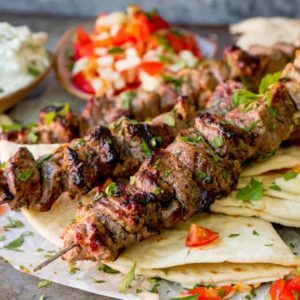 What kind of meat was used for the souvlaki? Is is shoulder of leg or ? Thank you! Hi Totati, either shoulder or leg is fine – Just try to get a lean cut, and trim of any excess fat. Thanks Becky really glad you like them 🙂 Great tip on the flatbreads. I always find decent ones difficult to find. Waitrose do some by ‘Dina’ that are pretty good. The ones in the picture involved a trek to the Cheshire Smokehouse. I’ll have to try the M&S ones. A lot easier! Thanks and Happy Fiesta Friday Sylvia! 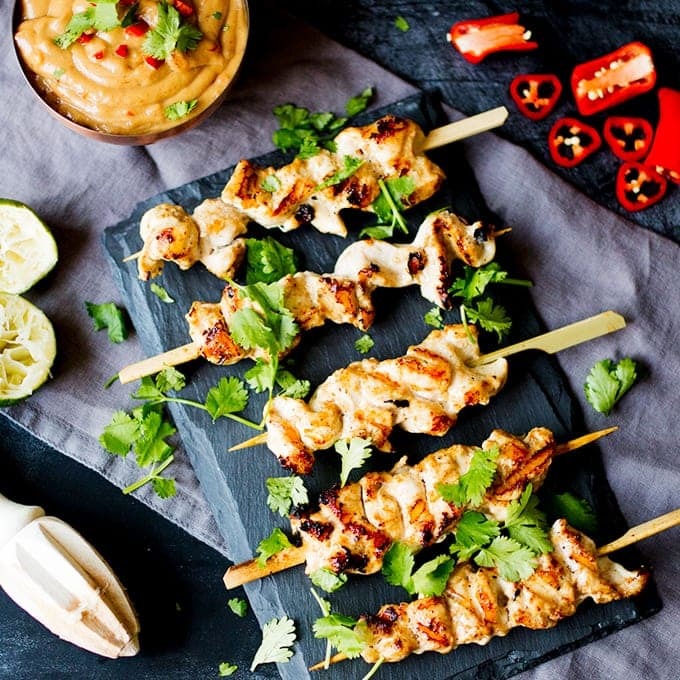 Those souvlaki kebabs look divine! Love the flavors and herbs you have added there, they do look totally moreish 🙂 Thanks for sharing at FF Nicky! 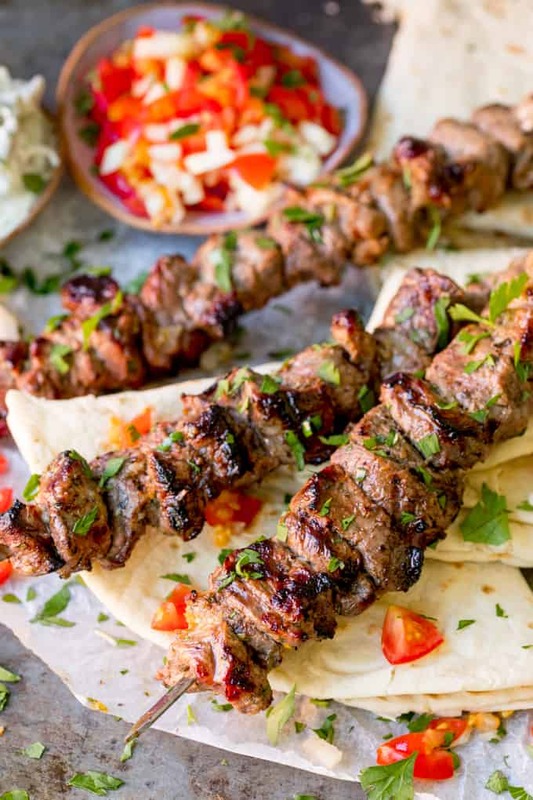 I love kabob in any form – and these look amazing! But tell us more about the bread – what is that bread under there it looks great? ?